SPY Out Of The Money Vol spiking relative to At The Money. Two days ahead of OPEX, market is gearing for some fireworks. The chart demonstrates the vol skew on SPY over the last three days. 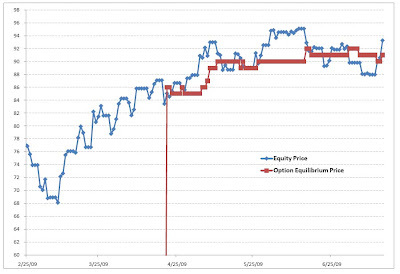 Today we have seen net Call covering and net Put buying - this is what one would expect given the current SPY price is way above the equilibrium option price. 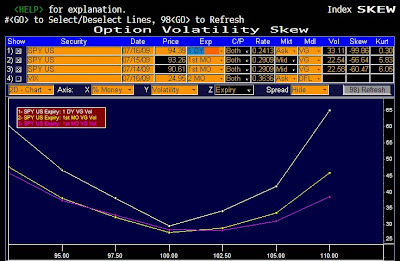 So Vol is dropping as it always tends to drop more quickly into OPEX, the skew is likely forcing near the money Vols down as dealers hedge OTM buying, also the net impact of the option action would mean net buying of underlying to delta hedge. With HFT taking away most of the market liquidity, could delta hedging be the primary culprit for the inexplicably stupid market move over the past week.